Their past has been washed away. The future looks hazy and bleak. That’s the grim fate of the thousands who are now crammed into the relief camps that have sprung up in the Andaman & Nicobar islands. Yet, when you have lost everything, hope can often spring back when a volunteer hands out a new set of clothes or a few meagre belongings to start a new life. Veera and Samuel are a couple from the Nicobari tribe that dominates the island of Car Nicobar which was ravaged by the December 26 tsunami. Two days after the traumatic event, they were airlifted to Port Blair on a giant IL-76 aircraft. Samuel says: "We were terrified as the aircraft soared up and took to the skies. We had no idea of what the future held." A week later, the Samuels are still shaky but the terror is beginning to fade. Now settled in a relief camp set up at the Nirmala Sen Secondary School in Port Blair, they are dressed in clothes donated by NGOs and the locals. With a sense of satisfaction, Veera says: "We have collected an entire suitcase full of clothes!" 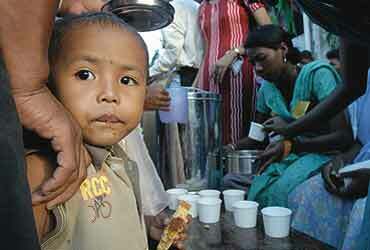 Clearly, the human spirit endures in the relief camps in these remote islands. According to official statistics, Samuel and Veera are among the over 21,000 displaced people housed in the various relief camps in the Andamans. These refugees are dependent on more than 1,000 tonnes of relief material that has come by. Creating a lifeline are the thousands of locals who along with several NGOs are involved in the Herculean task of providing a semblance of normal life. Ever since the tsunami waves smashed their way through these islands, a mammoth relief effort has slowly cranked into gear. Given the geography, the armed forces have played the most vital role. The statistics speak for themselves. The air force and the navy have flown more than 299 sorties since December 26. The aircraft and the ships have disbursed more than 400 tonnes of relief material in the far-flung islands. Besides, there were the displaced, most of whom arrived at Port Blair with just the clothes on their backs. They had to be housed, fed and clothed. As an interim measure, the administration announced an ex-gratia payment of Rs 2,000. But the scale of the disaster was far too huge for it to handle alone. Indeed, voluntary organisations have come to the rescue of those the giant waves spared. When calamity strikes, humanity binds. At the Tamil Medium School in Port Blair, volunteers from both the Ramakrishna Mission and the Jamaat-e-Islami Hind have been working together round the clock. As soon as the first batch of refugees arrived, the local branch of the Ramakrishna Mission came forward to adopt the camp. Aiding them in their efforts was a rush of volunteers from the Jamaat-e-Islami Hind who helped cook, clean and deliver the food and relief materials. While the Ramakrishna Mission has a fine tradition of voluntary work, Jamaat-e-Islami Hind is largely made up of daily wage earners who have given up their work and pooled in their meagre resources to look after the displaced. There is now a loose division of labour—the Mission has dispatched personnel to get in more relief material while the volunteers from the Jamaat have been effective in mobilising locals to help. The Nirmala Sen Secondary School, too is in the centre of activity, transformaing itself into a make-shift health centre. The local Pillar medical health centre rushed in doctors and nurses such as young Port Blair resident Sheeja John, a student of nursing. Doctors from the St John’s hospital in Bangalore were among the first batch to arrive to serve as medical volunteers and fanned out among other camps as well. In fact, while the government-run health machinery seemed paralysed in the early days, it was the Pillar medical centre that provided critical care at the various relief camps. "Initially, we requested some doctors from the government hospital to come and help us but they were unable to do so without proper orders," says Dr Vimal Raj who flew in from Bangalore. He says it was like being in a war zone, with the number of patients increasing by the hour. "We administered first aid but the more serious patients had to be rushed to the government hospital." Besides the specialist doctors and nurses, the ordinary volunteer has been central to the relief effort. When the first 400 displaced people walked into the camp set up at School Line on vip road, local figures like Ranjit Singh and Archana Serval stepped in to help them. Archana, originally from Port Blair now settled in France, was on a holiday when the tsunami struck. Now she has pooled in her money towards the relief effort and is working round the clock to gather food, clothes and medicines. She says that it was only after January 1, after lieutenant governor Ram Kapse came on a visit, that the administration began relief work in the school and the first relief material arrived on January 4. The same story is repeated in almost every other relief camp at Port Blair. While it took the Andaman & Nicobar administration almost a week to find its feet, the locals and the volunteers rallied around to help the displaced. To be sure, this was a mega-tragedy and no administration can really be expected to quickly counter such a crisis. The administration’s infrastructure had also been severely damaged in many places. Moreover, government employees also suffered personal tragedies, leading to further paralysis of relief efforts. Outlook has learnt that the initial paralysis led to critical delays. For instance, the 108 Mountain Brigade, housed in Port Blair, was mobilised only 48 hours after the tsunami struck. Brigade Commander J.M. Devadoss was asked to conduct a reconnaissance of the affected areas only on December 27. He returned and immediately planned relief operations in Car Nicobar and surrounding islands and dispatched his troops on December 28. But by then a crucial 48 hours had been lost and officials believe more lives could have been saved if the brigade had moved earlier. This was in stark contrast to the air force which suffered casualties on Car Nicobar but managed to land several aircraft just hours after the disaster. In the midst of tragedy there were also some administrative changes. The deputy commissioner at Car Nicobar, G.C. Joshi, was removed. Instead, the administration posted Udipta Ray, the personal secretary to the lieutenant governor, as the new deputy commissioner to oversee relief operations along with Brigadier Devadoss, now appointed overall relief commander on the ground. Also, an existing disaster management cell, headed by an additional district magistrate, folded up when disaster struck. While the administration had a disaster management plan on paper, it was clearly not equipped for a real-life disaster, let alone one of such a magnitude. With communications breaking down, it was left to the Andaman & Nicobar tri-services command to take the initial lead in relief operations. The initial confusion also meant that relief material and personnel were not coordinated and exploited to their optimum. For instance, 30 doctors landed at Car Nicobar to discover only 28 patients at the local Bishop John Richards Hospital. Dr Raj, who was present at the scene, cites this itself as a bottle-neck. He recounts the administration’s behaviour: "Initially the administration even refused to let doctors and nurses leave the island. When we saw there wasn’t much to be done, we had to request the deputy commissioner to let us go back to Port Blair where we were desperately needed rather than waste time on Car Nicobar which was anyway being systematically evacuated". Worried at the pace of relief efforts, the central government set up an Integrated Relief Command (IRC) with Kapse as chairman and the lieutenant general, B.S. Thakur, as its vice-chairman. "I feel that by setting up the command it has ensured seamless execution of operations," Thakur told Outlook. "Now if there is an issue that has to be sorted out, we do it at the highest levels and decision-making has been speeded up," he added. With the IRC and the administration finally finding its feet, some hi-tech nodules have now been set up to expedite the relief efforts. According to Kapse, a tele-medicine facility has been made operational and the National Informatics Centre here is gearing up to man it. There was more from him—"stocks of rice and dal are being distributed in a composite manner and work has begun on a Second World War vintage Old Japanese Road on Car Nicobar," Kapse said. He says once the Old Japanese Road is restored, it can serve as a lifeline for the island. Meanwhile, many of the displaced people at the relief camps are still hunting for their family members or trying to find their way out. K. Kanan from Hut Bay in Little Andaman says many of his relatives have found their way to Chennai. Says he: "I have been trying to reach Chennai for over a week and keep asking the authorities about when I can go there but no one seems to have an answer. Some even told me that I can take the flight or the ship back home if I pay for it. I don’t have money for a cup of tea. Or they ask for an identity card. Where will I produce an identity card since everything was washed away?" In the same relief camp is Anup Ghatak, waiting for a free ride to Calcutta. A Bengali married to a resident of the Nicobari islands, the pwd contractor says his life was idyllic till the tidal waves came and washed away his home. But Ghatak was still one of the more fortunate—both his children survived. He says: "I hear that the West Bengal chief minister has announced on radio that there are no affected Bengalis. Please go tell him that we are here." An hour later, the authorities announced the first batch of displaced to be sent to Calcutta. Anup’s face lit up. As always, life finds its way amidst death. Many of the displaced are finding hope in the babies who have been born in the camps just days after the tragedy struck. In the early hours of December 27, Namita Ray gave birth to a little baby boy in a relief camp. He has been named Tsunami by the camp doctors. She is probably the only person who will break into a smile at the mention of the word. Were the Shompen tribesmen washed away? The question still haunts the authorities as the hunt goes on.